This is a very small village on the Capricorn Highway, between Blackwater and Emerald. It is beside the Comet River, and was once a crossing for the old trail on to Springsure. There remains a pub, a few houses, and Leichardt's famous tree. The cemetery is somewhat in disrepair, and clearly is not in current use. In addition to the interments shown below there is a stone with Chinese characters. 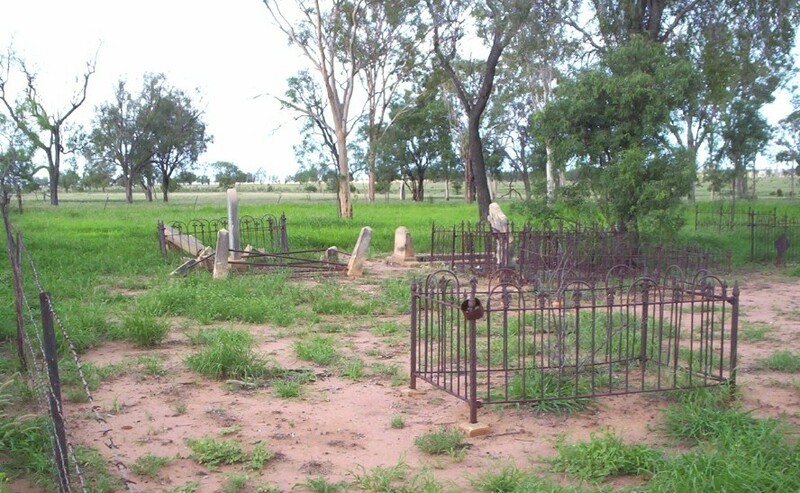 All graves are included irrespective of date. Comments:  Spouse of William Carrington. Died:  22 Feb 1916               At:  Accidentally drowned. Comments:  Spouse of May Gifford. Comments:  With Harriet Kitchiner. Sisters? Comments:  With Annie Kitchiner. Sisters? Comments:  Spouse of Thomas O'Reilly. Comments:  Son of Ellen Mary and Thomas O'Reilly.